← Friday 12th June 2015 – The greenhouse frame is up!! Now I wasn’t sure if I would be able to go to this year as everything is just so busy at home. But Sunday was free so off I went. I left home at 8.30am and after getting some fuel and some lunch I drove for 2 hours all the way up to Birmingham. I arrived just before 11am and as soon as I got inside I felt like I was home. Now where to start? Gardeners’ World first and them Good Food afterwards. That’s a good plan because by mid afternoon you’re starting to get a bit tired and peckish and they have lots of food samples for you to try. I got my free show brochure and marked down the places that I needed to find, and various stalls that I wanted to find and anything else was a bonus. Now I went with an idea of what I wanted to buy, but then just as I arrived I saw “The Greenhouse People”. Now I don’t need a greenhouse (I’ve got 2 you know), but my staging is very old, brittle, breaking and wonky. You can’t put too much weigh on the shelves otherwise they collapse. They had some really great deals so I had a quick chat with Rob and took a brochure and told him that I needed to figure out what I needed, but would be back at the end of the day (I’m sure they hear that a lot, but I wasn’t kidding). I then continued on wandering round and seeing what other wonders I could find. I saw some wonderful bird feeders, they were in all sorts of shapes sizes and colours. I think this is my favourite. 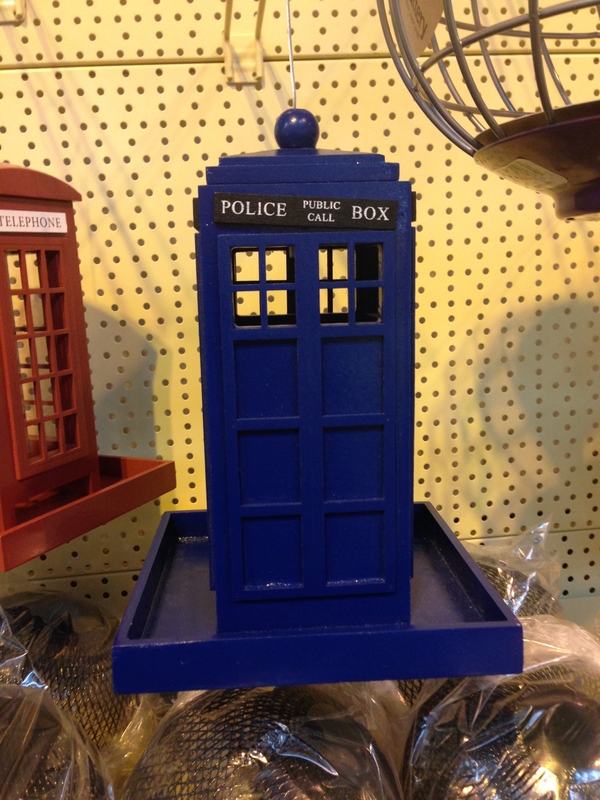 It’s bigger on the inside you know!! 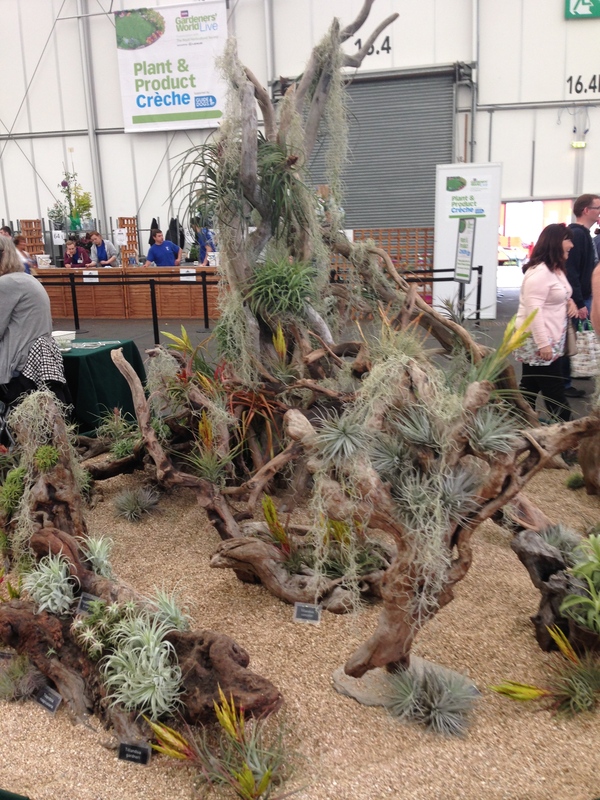 The show gardens were amazing and so imaginative. I then went in the marquee because I needed to find “Pennard Plants” because they have some wonderful varieties of seeds to try. I’ve picked up some rather strange seeds which I’ll sow next year, but you’ll have to wait until next year, no sneak peaks before hand. What a wonderful array of fruits and vegetables. There were wonderful displays of Lilies and Alliums, but the plants that amazed me more than anything are the “Just Air Plants”. They look like something that you’d find in a grave yard, they look all spooky and creepy. These plants are able to survive just by air alone. Perfect for those who forget to water their plants. Once I’d walked all around Gardeners’ World, it was then time to take what I bought back to the car. I then had my lunch and then moved on to Good Food. I was under strict instructions to come home with some lovely sausages, so I had to make sure I found some. If you’ve ever had “Heck” sausages you’ll know how tasty they are. If they’re in your local supermarket (they’re not in mine) give them a go. I also bought some cheese, brownies, cake and bread and lots of other things as well. 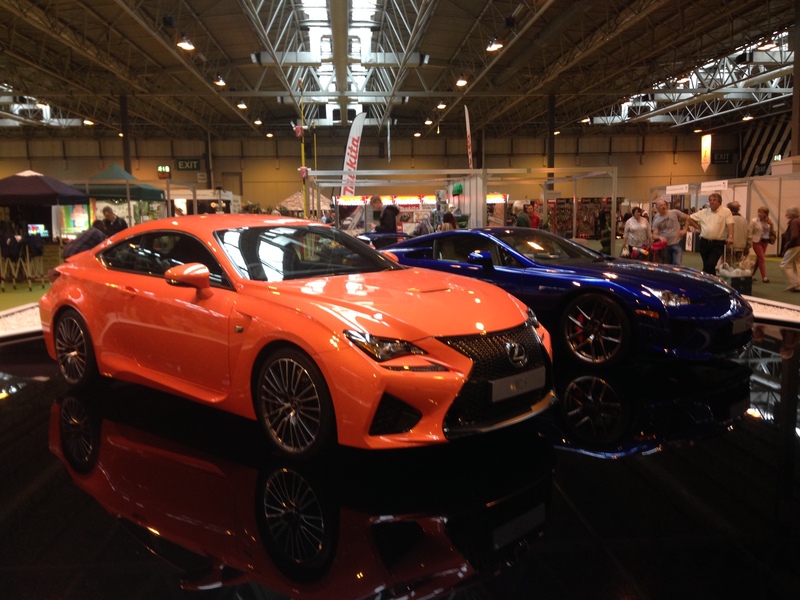 You could enter a competition to win one of these sports cars. They’re very nice, but not very practical for someone like me. I’m used to a large car. I like speed don’t get me wrong, if I got the chance to race round a track I would belt that car as fast as possible. But if I had one of these sports cars I would feel like I was having a mid life crisis. Please don’t take offence if you have one. Also you couldn’t fit much manure in this car. I can fit 28 bags in mine!! Very pretty, but not very practical. No room for manure!! Lakeland also had a stall and I had a wander round it. We have one in our town and I’m always drawn to go in. They had a couple of silicone cake moulds. 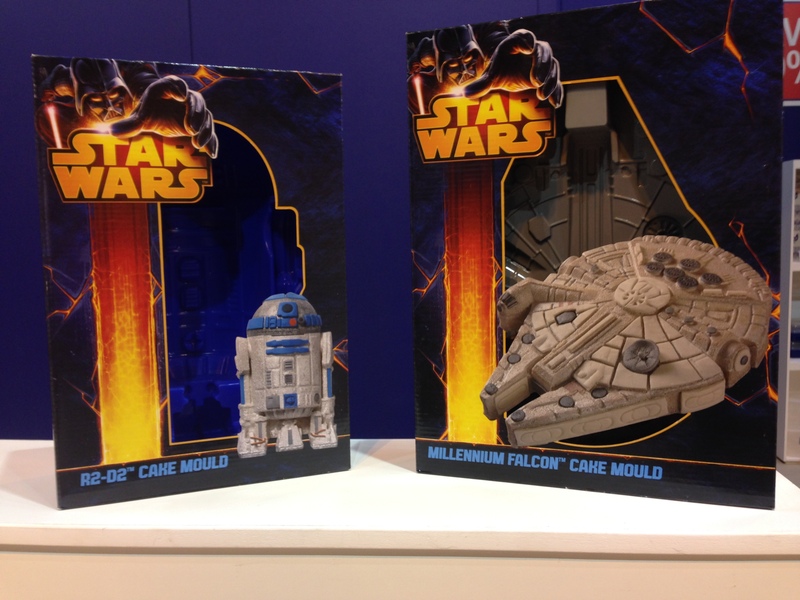 One was the Millennium Falcon and the other R2D2. I was tempted to get one for Mark for his next birthday cake, but he’s 42!! There is a point when you just have to stop!! No Princess Leia in the gold bikini silicone cake mould!! It was then time to go back to “The Greenhouse People”. I’d spoken to Mark on the phone about them and sent him a link. Even though it was my money I felt that I should talk to him before I bought what I needed. Mark said to me “You don’t have to justify it to me. You need it!” I love him so much. So I went back and found Rob (he remembered me), and after I’d double checked my calculations I placed my order. He gave me a discount because I bought so much and didn’t charge me for P&P. My order came to £628!!! Yes I know that’s a huge amount, but if I’d have bought it full price it would have cost me about £250 more!! It’ll last me for at least 15 years, if not longer. The frames are very sturdy metal and the trays are all very solid plastic. It’s just what I’ve been after. They should arrive this week, and then I’ll have the fun time of putting them all together. I then got back in the car and drove home. It took just under 3 hours because the M40 was very slow and then it was the joy of the M25. Mark had dinner all ready for me and after I’d eaten and given them all their little treats of brownies etc, it was time for bed. A wonderful day, and I’m so glad I went. I drove 251 miles today, so tomorrow I don’t think I’ll drive anywhere. I can’t drive tomorrow, Mark has the car!! This entry was posted in Uncategorized and tagged bread, brownies, cake, cheese, claire's allotment, gardeners world live, Good Food, Heck Sausages, just air plants, Lakeland, Millennium Falcon, NEC, Pennard Plants, R2D2, star wars, The Greenhouse People. Bookmark the permalink. 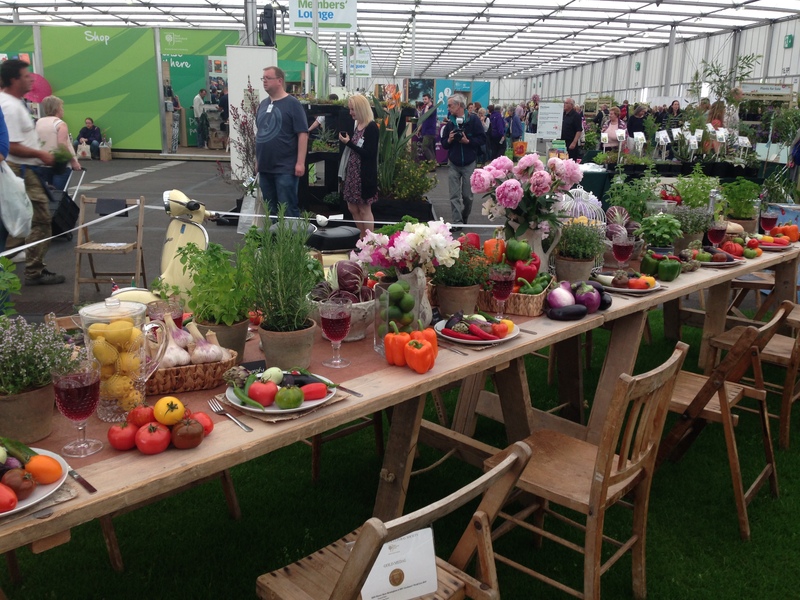 2 Responses to Sunday 14th June 2015 – Gardeners World Live at the NEC!! If you look on Amazon they have them. I can’t remember the name of the stall I saw it on, but it wasn’t the RSPB. They also had a red phone box as well.